The MOC wide angle cameras, although of very low resolution, have the advantage of areal and color coverage. Unfortunately, they suffer from extremely distorted viewing geometry during the present aerobraking orbit, stemming from the need to rotate the spacecraft to acquire images while the spacecraft altitude and latitude varies. However, by combining knowledge of the spacecraft motion and pointing with understanding of the distortions within the camera lenses, it is possible to reconstruct the data as if viewed from a specific point in the orbit. 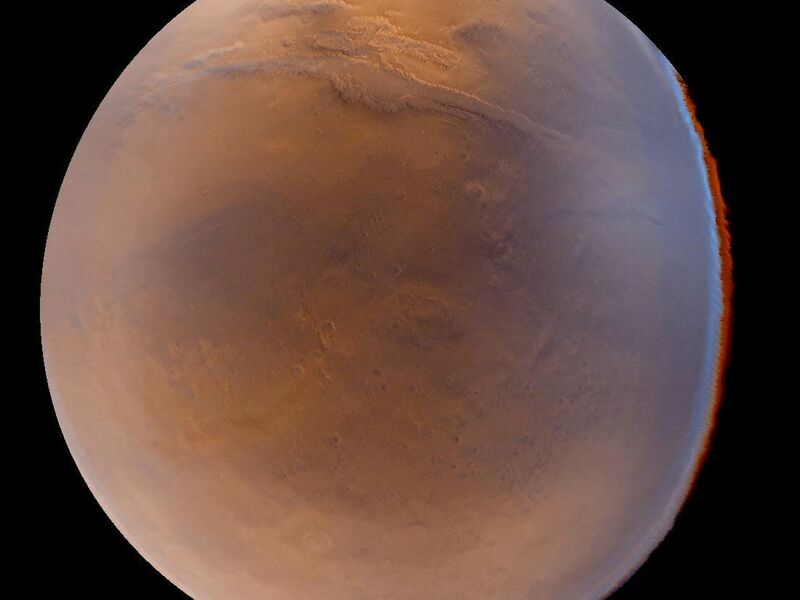 Such a reconstruction is shown in the image above, a view of Mars as it would appear to a person with a wide angle lens at a altitude of about 2700 km (1690 mi) above 30 degrees South latitude, 70 degrees West longitude. It is reproduced here at close to its original, 7.4 km (4.6 mi) resolution. 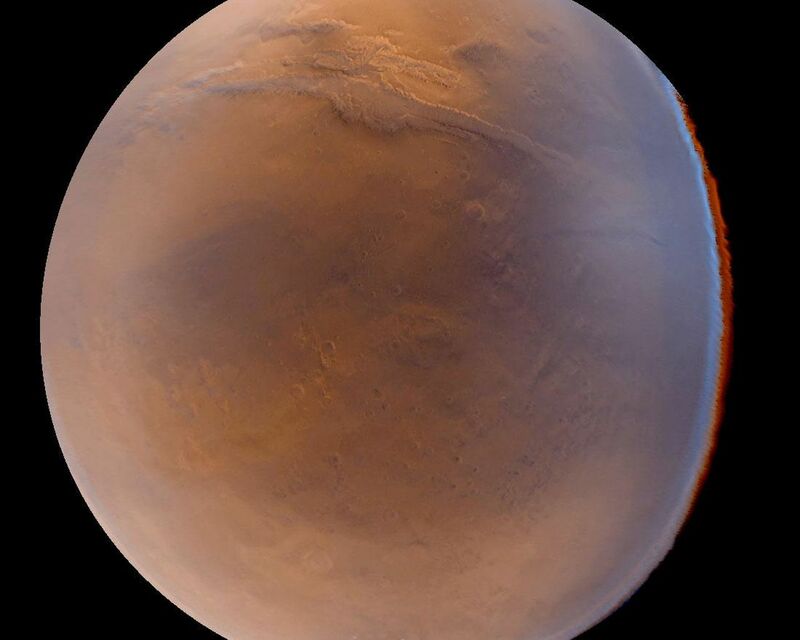 About 100 degrees of latitude and longitude are visible, with the seasonal south polar carbon dioxide frost cap at the bottom and a portion of the Valles Marineris stretching across the upper quarter of the picture. 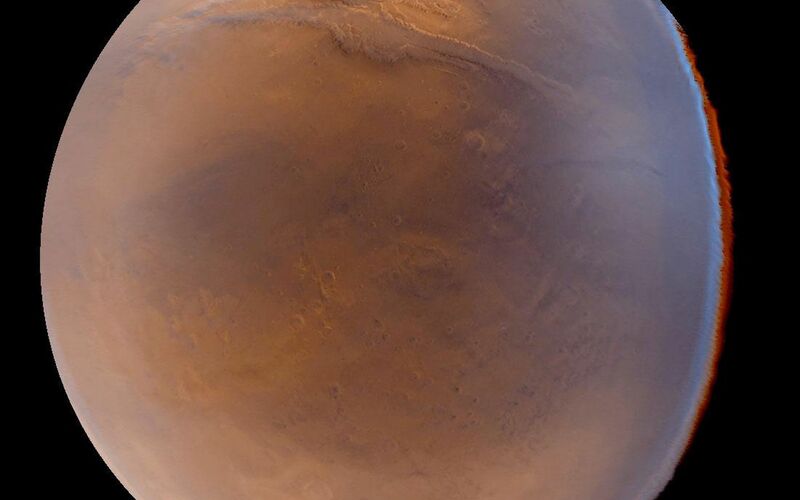 Color fringing along the right side of the image, and the slightly non-circular outline of the edge of the planet, result from unmodelled spacecraft attitude relationships and lens distortion as these differ between the two cameras (red and blue; green is synthesized by combining red with blue). 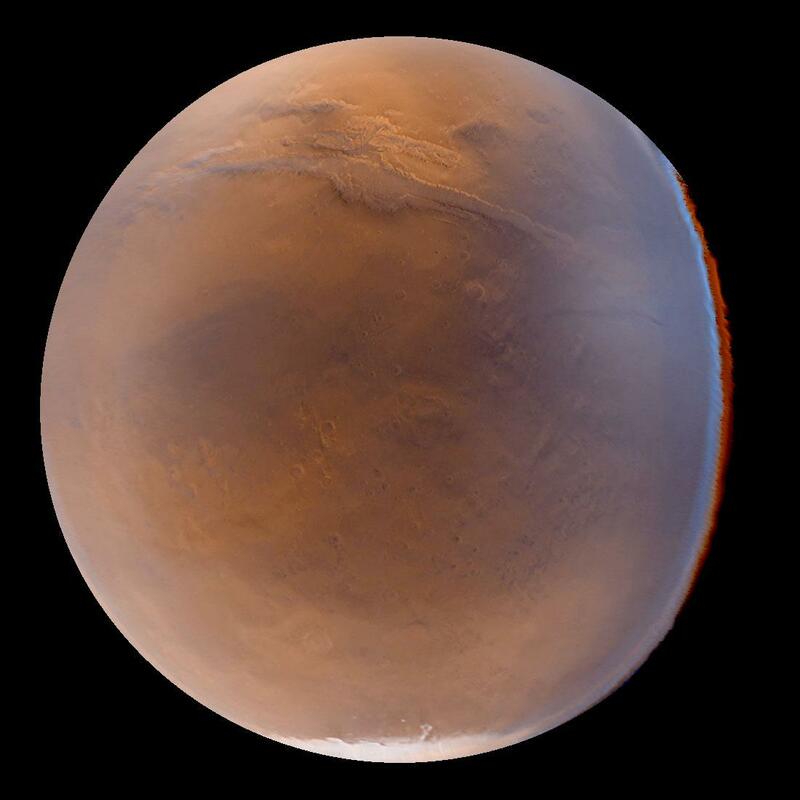 This image was taken three weeks after a large regional dust storm had developed, and the hazy appearance, especially towards the edges of the planet, results from atmospheric dust.